We all want the best for our children and ourselves ? Martial arts can offer so many benefits and opportunities that other sports cannot. Nactics dont make promises we cannot achieve we deliver results.. PLEASE keep reading our site and see what we can do for YOU.. These are just a few of the things we can do for you and your children. Can you take the RISK ? Give Martial Arts a try What have you got to loose ? 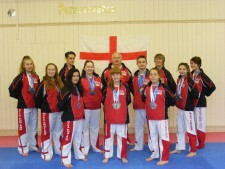 We came back from SPAIN with 16 GOLDS 10 SILVERS 10 BRONZE. We are so proud of everyone of our students who competed with 4,000 other athletes from over 70 countries in the largest Martial art event ever held. YOU COULD BE THE NEXT !! Our centre is 5 minutes from junction 39&40 M1 situated on Horbury Road (WF2 8TU) above "Pizza hut " 2 minutes from the centre of Wakefield with ample free parking offers students from 3+ the ultimate in Martial Art instruction on 3 matted areas. We also have a satellite school at Eastmoor Interested ? ring 07909-752798 for further exciting details. At NACTICS MARTIAL ARTS our objectives are to attain real excellence.All abilities and ages are welcome. We listen to you and help you achieve your goals. Martial arts will help with your general fitness and mobility. But it will also help with your discipline, self control ,and help you feel safer. All our clubs have a relaxed friendly but professional atmosphere in which we aim to build a personal and constructive relationship between the students and instructors. Our instructors are "REAL BLACK BELTS" & amongst the finest in the area, they have Enhanced Police checks and pride themselves on having a truly in-depth knowledge of martial arts. Each of them have received instruction from BBSI both in the UK and the USA beware of "in house" so called qualifications. Unlike many academies and schools we encourage parents to watch their children train. We have nothing to hide and pride ourselves on our teaching methods. Remember its not the size of the trophies ! But the quality of the teaching that counts.. EXCELLENCE IS OUR GOAL. Make it yours. Call 07909 752798 now for your FREE MARTIAL ARTS trial lesson. Copyright NACTICS MARTIAL ARTS 2019©. All Rights Reserved.